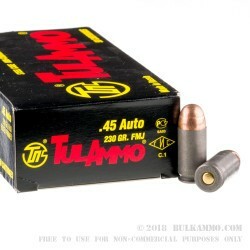 These 50-round boxes of .45 Auto cartridges from Tula will serve the needs of high volume shooters well. 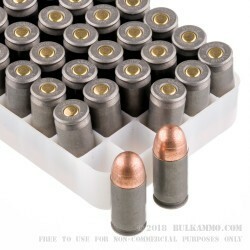 Offered at a bargain price, this ammo uses non-corrosive Boxer primers and non-reloadable steel cases coated in polymers specially chosen for their non-toxic content. 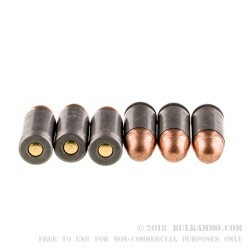 The bullet itself is a bimetal full metal jacket of typical 230-grain weight and achieves a muzzle velocity of 850 feet per second. It will work well in any .45 ACP firearm including the Glock 21, 1911, and Sig P220. TulAmmo comes from the Tula Cartridge Works which, as the name suggests, makes its home in the Russian city of Tula south of Moscow. Tula Cartridge Works got its start as a contract supplier to the Russian Empire, manufacturing 210 million cartridges over seven years in its first contract in the 1880s. Today, the plant’s total output in one year reaches into the billions, and its exports to the US total more than 500 million. The company began producing steel-cased ammunition in the 1920s to take advantage of Russia’s plentiful iron ore deposits. Best bang for the buck !! A bargain - buy it! Thanks for following thru with what you advertize! Great for the range plinking targets. One failure to ignite in 100. A little dirty, but that was expected. Accuracy was fine for target practice. I've shot over a thousand rounds of this stuff. Never had a single round fail to fire. I've had a few stove pipes, and a couple of failure to feeds. However, all problems have occurred after firing several hundred rounds. The ammo is a little dirty, but what ammo isn't. I've shot most brands of ammo on the market, some better some worse, overall this stuff is right up there in reliability. Bang for the buck? So far for me anyway, None compare! This is some of the best ammunition I have shot, especially for the low price. Q: I have a Hi-Point 45ACP+P. I was wondering if you have heard of any problems with this ammo cycling through this firearm. It is being well lubricated with Rem-Oil. A: We haven't had any reports of problems with this Tula ammo in Hi-Points. Still, you might want to try buying a small amount of ammo to test before you purchase a large amount. Q: Have you had anyone complain of this causing short stroking or stovepipes? Sorta trying to track down if the issue is ammo, mag or gun related. A: What type of firearm is being used and how is it being lubricated? Q: Are these steel casings reloadable? I see they are boxer primed, but I'm not sure since they aren't brass. Thanks! 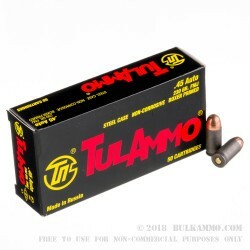 A: No, these Tula 45 ACP rounds are not reloadable.